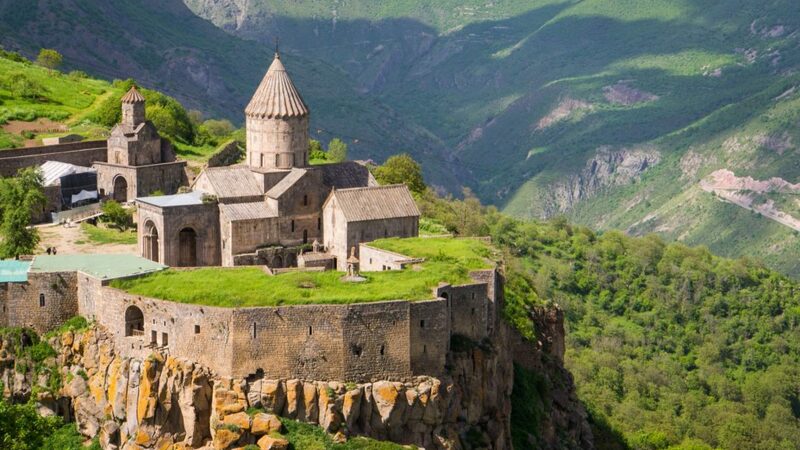 Many of Armenia’s most famous Christian monasteries are dramatically situated amid towering cliffs or on precipitous mountainsides with panoramic views across the rugged landscapes of the Lesser Caucasus. In ancient times, accessing these centres of study and worship required the laborious construction of steep footpaths and rock-hewn steps from neighbouring communities, and many such routes survive today as hiking trails. Instead of driving to Tatev or taking the cable-car from Halidzor, begin instead from Satan’s Bridge (aka: Devil’s Bridge), which can be found at the point at which the H45 road crosses the Vorotan River at the bottom of the gorge below Tatev. This site gets its name from the natural rock bridge above the Vorotan River as it gushes through a series of caves and fissures. On the same site are several natural mineral springs of varying temperatures; one has had a small bathing pool built around it with a changing cubicle nearby. From just beyond this point, visitors with a head for heights can clamber (at their own risk) down a rickety rope-ladder into the depths of the canyon – to be honest, it is rather difficult to appreciate this marvellous creation of nature without doing so. From the information board in the parking area opposite, two waymarked trails wind their ways up the sides of the impossible-looking canyon to Tatev Monastery on its iconic clifftop perch. Both routes begin by following the river downstream (south) on its east bank, then crossing a newly installed bridge before climbing a short distance to the impressive monastic complex of Tatev Grand Hermitage (the Armenian word for hermitage, anapat, also happens to mean ‘desert’, and is occasionally mistranslated out of context). Built in the 17th and 18th centuries, the hermitage was both an educational and spiritual centre, accommodating 500 monks. The central Mother of God Church, dating from 1663, is a three-aisle barrel-vaulted basilica with a small central belfry. It has a gallery at its west end and a gavit was added on the north side in 1743. The rectangular site is surrounded by high defensive walls, built in the middle of the 18th century, with the main gateway to the northwest. An extensive range of domestic buildings lines the wall, including monks’ cells, a kitchen with a large fireplace in the southeast corner, an adjacent dining room and possibly inn accommodation, with water troughs, for travellers. The two hiking trails diverge beyond the hermitage. The shorter and more popular of the two follows an old cart track as it zigzags up the steep hillside directly below the monastery, winding among the orchards that formerly helped feed the complex’s inhabitants. The route is waymarked throughout with red and white painted blazes (though there are few opportunities for diversion) and will take 1½–2 hours to reach the top of the gorge, where the trail joins the road to Tatev for the final few hundred metres. A longer and equally spectacular route continues from the hermitage in parallel to the river before climbing up a side valley south of Tatev itself to the tiny village of Tandzatap. This route is less frequented but still waymarked throughout, with a second information board in Tandzatap itself. Again, allow 1½–2 hours to reach the village, and a further hour or so to walk the quiet country roads that traverse the upper part of the valley to Tatev, providing dramatic views of the monastery on the approach. The fortified clifftop monastery of Tatev dates to the 9th century. Its greatest importance was in the 14th and 15th centuries under Hovnan Vorotnetsi (1315–88) and Grigor Tatevatsi (1346–1411). The date of the now vanished first church at the monastery is unknown, but in 844 Bishop Davit persuaded the Princes of Syunik to grant lands which would support the founding of a monastery worthy to house the relics which the church in Syunik possessed. His successor, Bishop Ter-Hovhannes, built the main church, dedicated to Sts Paul and Peter between 895 and 906. If you plan to leave a vehicle at Satan’s Bridge, or otherwise arrange private transport, the two trails combine naturally to form a wonderful (if hilly) full-day hiking loop, with a break for lunch at one of the cafés above Tatev Monastery and an hour or so to explore the complex itself before descending. Beautiful Noravank – the Armenian monastery featured on the front cover of the 4th and 5th editions of the Bradt Guide to Armenia – is considered all the more gorgeous because of the cavernous crimson canyon in which it sits. Unbeknown to most visitors, however, it is possible to follow this gorge all the way from its upstream (southern) end near the village of Gnishik using a series of ancient footpaths used by inhabitants of nearby villages to access the monastery, which together form one of the most wild and dramatic of all of Armenia’s gorge hikes. Reach Gnishik via the mostly-paved H40 road, signposted just east of the main road turnoff for Yeghegnadzor, stopping perhaps at the Dali Khach shrine perched atop the mountain pass before the descent to the village. Just before Gnishik itself, turn right onto a substantial dirt track (4×4 required or walk from here) which will take you to a riverside clearing known as Jafar Grove. Continue following the fainter jeep track (several shallow river crossings are involved) along the river until the track heads south along a side valley. Rather than following this track, continue along the narrow footpath that follows the south bank of the river along the main gorge. This narrow path continues for a couple of kilometres before reaching the narrowest part of the gorge and climbing steeply to the clifftop. At the top of the slope, the route rejoins an established dirt road, continuing to the site of the historical settlement of Hin (‘Old’) Amaghu. From this point on, the trail is waymarked; the short side trail to the outcropping known as ‘Harp Rocks’ is worth the detour and will give you your first distant glimpse of the monastery in the gorge below. You’ll briefly join the paved road between Areni and Khachik, before turning right on an (again waymarked) old dirt road through the ruins of Nor (‘New’) Amaghu. The northwest edge of the village marks the start of the final descent into the gorge on perhaps the most spectacular ancient footpath of all, made all the more so by Noravank coming into view as you descend. From where you emerge onto the road at the bottom of the gorge, a very steep and rough trail climbs the hillside to Noravank from the opposite side of the river, but it is certainly an easier (if longer) option to simply follow the paved road the rest of the way to Noravank. As you approach the monastery itself, the striking two-storey building that you come to first is actually a mausoleum with another church on top of it, and is the newest part of the establishment. The larger complex of buildings beyond is older; the oldest part of all is the ruined 9th- or 10th-century church of John the Baptist at the southeast corner. The site was developed mainly in the 13th century by the Orbelian princes, a branch of the Mamikonian family which had settled in Georgia in the 9th century and members of which had held the position of commander- in-chief of the Georgian forces in the 10th and 11th centuries. The Georgian army, which included many Armenians, defeated the sultan in 1204 and many families from Georgia moved into Armenia including the Orbelians who settled in Syunik. The Orbelians built several churches to act as burial places for the family and the see of the bishopric of Syunik was moved here to Noravank. Though only 11km in length, allow a full day for this challenging hike due to the wayfinding that may be required on the parts of the route that remain unmarked. Note also that mobile phone reception is unavailable in much of the gorge, and prepare accordingly. A shorter, simpler and less challenging variant would be to travel by road from Areni to Nor Amaghu, hike to Hin Amaghu and the Harp Rocks lookout, then return by the same route and descend to Noravank as described above. Perhaps the classic hike in Dilijan National Park, this 7.2km trail was completely rebuilt by volunteers in 2017 as part of the Transcaucasian Trail long-distance hiking route through the region, and will take 2½–3 hours to complete. Beginning from the Parz Lake family activity centre and café (to which taxis from Dilijan are easily procured), the route follows a dirt road up the valley for 1km to a bridge across the river. From a clearing shortly beyond the bridge, the new trail branches off to the right and passes through deep broadleaf forest as it gradually climbs to the subalpine meadows above the treeline. There is a picnic shelter and public toilet shortly before the crossroads at the high point of the trail, with good views across the park in all directions. From the crossroads, take the second track on the left as signposted, heading roughly east between the two lines of trees, then cutting south across the meadow (again as signposted) to find the entrance to the forested descent towards Gosh village. This – a much quieter route than the previously used badly-eroded jeep track – will bring you out just north of the village, where rock outcroppings afford a good overview of the monastery of Goshavank and the surrounds. Pick your way down through the rocks, following the clear trail down past the village cemetery and to the monastery complex and village square, from where refreshments and transport are available. Goshavank itself was established in the late 12th century by the cleric Mkhitar Gosh (1130–1213) with the support of Prince Ivan Zakarian to replace the monastery of Getik, about 20km further east, where he had previously worked but which had been destroyed in an earthquake. Originally called Nor (New) Getik, it was renamed in honour of its founder immediately after his death. The earliest part of the complex, the Mother of God Church, dates from 1191; its gavit was completed in 1197 followed by the two St Gregory chapels, the free-standing one with its particularly fine carving in 1208 and the one attached to the gavit in 1237. The library and the adjacent school buildings were built in 1241 of large rough-hewn stones. In 1291 the Holy Archangels Church with belltower was added on top of the library, access to the church being via the external cantilevered steps. The belfry later collapsed and the building is now protected by a conical transparent dome. Another feature of the monastery is the particularly fine khachkar, by the door of the 1237 St Gregory chapel, which dates from 1291. Poghos, its sculptor, carved two identical khachkars for his parents’ graves and the other is in the History Museum of Armenia in Yerevan. The delicate filigree of his carving led to his sobriquet ‘Poghos the Embroiderer’. The two small rooms to the south of the gavit were used as studies by religious students. There is a walnut tree at the north of the site, of a similar age to the monastery. Another of Armenia’s classic gorge walks (though suffering from noise due to heavy roadbuilding machinery in the gorge at the time of research), this trail properly begins at Tsiranavor (‘Apricot’) Church on the cliff’s edge east of Odzun. Many visitors begin at the historically significant church in Odzun itself, dating from the 6th century, reconstructed in the 8th, and one of Armenia’s finest basilicas with a cupola. It stands on the site of an early 4th-century church (303–13) which was destroyed by an earthquake in the 5th century. Tradition holds that the apostle Thomas ordained priests at Odzun on his way to India and that before he left he buried Christ’s swaddling clothes where the present altar stands. A 6th-century inscription above the southern door of the church records this tradition. Descending the zigzag footpath from Tsiranavor, the trail then follows the bottom edge of the cliffs south before climbing back up to the ruined Horomayr Church which is right on the edge of the gorge. It was built in the 7th century and rebuilt in the 13th using a darker stone. The darker stone, having scarcely weathered, almost has the appearance of concrete and contrasts considerably with the warm honey-coloured older stone, which has weathered badly. A small central gavit, paved with gravestones, leads into the dark- stone barrel-vaulted church on the south and pale tuff chapel on the north. The tiny Holy Cross Chapel can be seen below and in spring the plateau is covered by an amazing carpet of flowers. Continuing along the trail at the base of the cliffs, the route passes another rock-hewn staircase that leads up to the village of Aygehat, before winding down to Kobayr Monastery, which is almost impossibly situated beside a cavernous formation of basalt columns near the bottom of the gorge. The fortified monastery complex once covered a large area; restoration continues interminably and at a snail’s pace, presumably in part because of the difficulty of hoisting materials to the precipitous site. According to an inscription, the main church was built in 1171 by Mariam, daughter of Kyurik II. At this time the Turkish Seljuks ruled Armenia but delegated control to local princes. Following Georgian victories over the Seljuk Turks in 1195 and 1202 the monastery came under Georgian rule, passing into the control of the Zakarian family who adhered to the Georgian Orthodox Church rather than the Armenian Church. (The Georgian Church differed in having accepted the views of the Council of Chalcedon, which took place in 451, over the duality of Christ’s nature.) This explains the existence of Georgian features, notably the Georgian-style frescoes and carved inscriptions. The belltower/mausoleum, north of the main church, in the centre of the monastery was built in 1279. The mausoleum houses the tombs of Shanshe Mkhargrdzeli and his wife Vaneni and has a spring flowing through it, a feature which may indicate that this has been a religious site since pagan times. The 13th-century refectory is between the main church and the mausoleum slightly up the hill. Surrounding the whole complex was a fortified wall and the well-preserved gateway lies to the north of the main group of buildings together with a further small church dated 1223. From Kobayr, there are two routes to reach the bottom of the gorge and the main road. The first involves clambering down from the fortified wall at the bottom edge of the complex, from where steep and often slippery footpaths meander through terraced gardens and the hamlet of Kobayr before reaching the railway line and then the main road. The second follows a set of (again, often slippery) stone stairs towards the cavern south of the monastery and then down to a flat area below the southern wall, where a 4×4-accessible dirt road leads down to the main road opposite the town of Tumanyan. The route is about 9km in length and can of course be hiked in either direction; allow 3–4 hours at least, depending on time spent at each of the historical sites or simply admiring the views. From Hovk, follow the painted blazes along the dirt road that winds up through the hills among patches of oak woodland to an expanse of flatter land in front of the first big limestone buttress. Two routes exist for the first portion of the hike; one that traverses through the forest below the cliffs along a historical footpath, and another that climbs up above the cliffs via an ancient rock-hewn staircase. Both routes bear west, roughly following the cliffs either above or below and passing several seasonal farming encampments. The higher route affords the better panoramas but is more exposed; in bad weather the lower route may be the wiser choice and the view of the cliffs from below is some compensation for losing the view from the ridge. In either case, this is a long day’s walking on good dirt roads through subalpine meadows and alpine pastures where horses and cattle roam freely. Following the waymarks will eventually bring you down again to a more established farmstead, and from the steep track below this farm you will find a turn-off to the right that takes you back onto a footpath and down through the forest to join the Hidden Waterfall Trail. It’s worth the few minutes’ detour to the waterfall itself, where the hardy may enjoy a bracing dip in the plunge pool below the waterfall. Otherwise, follow the signposted trail back to Haghartsin Monastery, where you might enjoy some freshly-baked gata from the on-site bakery. As at so many monasteries, the original small church was joined by other buildings over the centuries and is now rather dwarfed by its less ancient neighbours. The oldest part is the St Gregory Church, probably dating from the 10th century and with an octagonal tambour. This church was damaged by Seljuk invaders and had to be reconstructed after the Georgian victories over them. This reconstruction was followed by a large increase in the monastery’s size and an important school of church music became established here which developed a new system of notation for the Armenian liturgy. A relief of the donors with a dove (symbolising the Holy Spirit) above them can be seen on the east façade, pointing to a model of the church. Finest of all the many khachkars in the monastery is the one carved by Poghos in the 13th century, which is outside the south door of the Mother of God Church. Among the other buildings which can be seen are the monastic bakery complete with oven. To the south of the gavit of St Gregory’s are the reconstructed royal tombs of the Bagratid dynasty. There’s no overnight accommodation at the site (though the staff are usually happy to allow camping behind the main church), but a good paved road means that onward taxi travel to Dilijan or elsewhere is easy to arrange. Alternatively, consider following the 24km continuation of the Transcaucasian Trail the following day over the hills to Jukhtakvank and thence to Dilijan. This article contains several edited excerpts from Armenia: The Bradt Travel Guide (5th edition), available now direct from Bradt, as well as from Amazon* and all good bookstores.